Case of mistaken identity? - Patrick C. Fagan, Q.C. A Mexican allegedly involved in Calgary’s largest cocaine-smuggling bust may not be who he claims to be. That’s what Crown prosecutor Dan Misutka hopes to prove if Justice Scott Brooker decides today to permit a witness to testify via video conference from Puerto Vallarta, Mexico. The same request by Misutka was turned down by the judge earlier this week during the Court of Queen’s Bench trial of the accused. Misutka renewed his application and requested a six-week adjournment when he offered the judge some assurance the witness would be under oath and compelled to answer questions, even though he is outside the court’s jurisdiction. He suggested it could be done through a treaty between the two countries. The accused, 39, was arrested and charged with importing and possession for the purpose of trafficking after 60 kilograms of cocaine was found in another Mexican couple’s luggage at Calgary International Airport on Sept. 3, 1999. Police suspected he was the pickup man for the huge amount of illicit drugs. 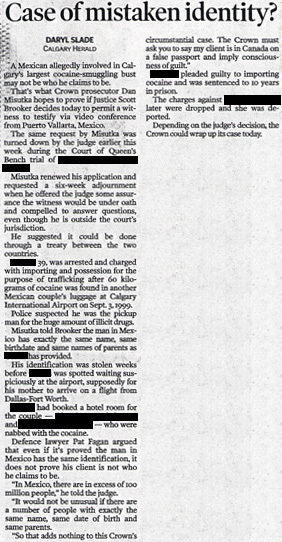 Misutka told Brooker the man in Mexico has exactly the same name, same birthdate and same names of parents as the accused has provided. His identification was stolen weeks before the accused was spotted waiting suspiciously at the airport, supposedly for his mother to arrive on a flight from Dallas-Fort Worth. The accused had booked a hotel room for the couple — Ricardo Rangel Corona and Evelia Robles-Barreto — who were nabbed with the cocaine. Defence lawyer Pat Fagan argued that even if it’s proved the man in Mexico has the same identification, it does not prove his client is not who he claims to be. “In Mexico, there are in excess of 100 million people,” he told the judge. “It would not be unusual if there are a number of people with exactly the same name, same date of birth and same parents. Corona pleaded guilty to importing cocaine and was sentenced to 10 years in prison. The charges against Robles-Barretolater were dropped and she was deported. Depending on the judge’s decision, the Crown could wrap up its case today.